Trees columnar; twigs red-dish, smooth. Leaf blades (8-)10-16(-30) × (2.5-)3-5 cm, margins toothed on distal 1/2 (rarely proximal to middle), teeth deciduously gland-tipped, abaxial surface with 2-7-fascicled, straight hairs. Pedicels 1-2 mm diam. at narrowest point. Flowers: sepals obovate, 9-11 × 7-9 mm, base constricted; petals to 2-3 × 1.5-2.5 cm, apex rounded; filaments: free portion 4-6 mm. Capsules 1.5-2 × 0.9-1 cm, hairy; columella adnate to valves at base. Seeds 9-11 mm including apical wing, 3-3.5 mm wide. 2n = 30, 36. Flowering (Apr-)Jun-Jul(-Oct). 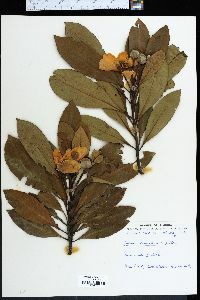 Wet soils, including swamp forests, especially pocosins, wet savannas, bay forests, depressions in fluvial sand ridges; 0-200 m; Ala., Fla., Ga., Miss., N.C., S.C. Gordonia lasianthus is relatively common in the southeastern United States. NatureServe lists its global status as G5, and it is of conservation concern in Mississippi (S3, vulnerable) and Alabama (S1, critically imperiled). Specific threats are not indicated; Mississippi is at the western edge of the range; habitat in Alabama is likely under development pressure. It is a handsome columnar tree that is occasionally available as an ornamental in the horticultural trade. Senescing leaves turn bright red before falling. It is listed as a facultative wetland species by the USDA Plants database for region 2.